2K Sports announced today the complete track list for this fall's highly anticipated basketball video game, NBA® 2K10. The soundtrack will feature a cross- genre lineup of music by top artists such as Kanye West, MGMT, K'naan, Metric, Ratatat and more. The soundtrack also includes an original song from Grammy-nominated artist, The Game, titled "Champion." Celebrating the 10th anniversary of the hugely popular NBA 2K franchise, the #1 selling basketball video game* and #1 rated NBA simulation**, 2K Sports will enhance its long-standing reputation of bringing an eclectic mix of breaking and established artists to its gaming audience. Renowned for its expert fusing of music and gaming, 2K Sports will take this expertise to a whole new level with NBA 2K10 by utilizing several unique out-of-game opportunities to draw attention to the title's featured artists. Past and present initiatives have included mix tapes, exclusive music downloads, music videos, in-game characters, live performances and music tours. In NBA 2K10, some of the featured music artists will also make in-game cameos as playable characters, including Kanye West, The Game, Asher Roth, David Banner, Twista, Pitbull, and a variety of others. Each of the in-game artists will appear exclusively in the NBA 2K10's Streetball mode. 2K Sports is also offering fans the special opportunity to download two exclusive full tracks for free from the official NBA 2K10 soundtrack - "They're Everywhere" (Izza Kizza) and "Run Away" (Donnie Bravo). To download these tracks now, please visit: http://www.2ksports.com/nba2k10tracks. Developed by 2K Sports' Visual Concepts studio, NBA 2K10 is rated E by the ESRB and will be available on October 6 for Xbox 360® video game and entertainment system from Microsoft, PLAYSTATION®3 computer entertainment system, PlayStation®2 computer entertainment system, PSP® (PlayStation®Portable) system, Wii™ system from Nintendo, and Windows PC. 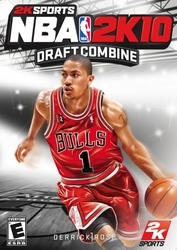 For more information, please visit http://www.2ksports.com/games/nba2k10. *According to The NPD Group estimates of U.S. retail video game sales of Xbox 360 and PLAYSTATION 3 NBA titles from October 2008 through July 2009. **The NBA 2K series, published by 2K Sports, outranked competitors based on GameRankings.com average scores of 2001-2008 NBA video games. Headquartered in New York City, Take-Two Interactive Software, Inc. is a global developer, marketer, distributor and publisher of interactive entertainment software games for the PC, PlayStation®3 and PlayStation®2 computer entertainment systems, PSP® (PlayStation®Portable) system, Xbox 360® video game and entertainment system from Microsoft, Wii™ and Nintendo DS™. The Company publishes and develops products through its wholly owned labels Rockstar Games and 2K, which publishes its titles under 2K Games, 2K Sports and 2K Play. Take-Two also distributes software, hardware and accessories in North America through its Jack of All Games subsidiary. The Company's common stock is publicly traded on NASDAQ under the symbol TTWO. For more corporate and product information please visit our website at http://www.take2games.com. The NBA and individual NBA member team identifications used on or in this product are trademarks, copyrighted designs and other forms of intellectual property of NBA Properties, Inc. and the respective NBA member teams and may not be used, in whole or in part, without the prior written consent of NBA Properties, Inc. (C) 2009 NBA Properties, Inc. All rights reserved. "PlayStation", "PLAYSTATION", "PS" Family logo and "PSP" are registered trademarks of Sony Computer Entertainment Inc. PSP® system - Memory Stick Duo™ may be required (sold separately). The statements contained herein which are not historical facts are considered forward-looking statements under federal securities laws and may be identified by words such as "anticipates," "believes," "estimates," "expects," "intends," "plans," "potential," "predicts," "projects," "seeks," "will," or words of similar meaning and include, but are not limited to, statements regarding the outlook for the Company's future business and financial performance. Such forward-looking statements are based on the current beliefs of our management as well as assumptions made by and information currently available to them, which are subject to inherent uncertainties, risks and changes in circumstances that are difficult to predict. Actual outcomes and results may vary materially from these forward-looking statements based on a variety of risks and uncertainties including: our dependence on key management and product development personnel, our dependence on our Grand Theft Auto products and our ability to develop other hit titles for current generation platforms, the timely release and significant market acceptance of our games, the ability to maintain acceptable pricing levels on our games, our reliance on a primary distribution service provider for a significant portion of our products, our ability to raise capital if needed, risks associated with international operations, and the matters relating to the investigation by a special committee of our board of directors of the Company's stock option grants and the claims and proceedings relating thereto (including stockholder and derivative litigation and negative tax or other implications for the Company resulting from any accounting adjustments or other factors). Other important factors and information are contained in the Company's Annual Report on Form 10-K for the fiscal year ended October 31, 2008, in the section entitled "Risk Factors," as updated in the Company's Quarterly Report on Form 10-Q for the fiscal quarter ended July 31, 2009, and the Company's other periodic filings with the SEC, which can be accessed at http://www.take2games.com. All forward-looking statements are qualified by these cautionary statements and apply only as of the date they are made. The Company undertakes no obligation to update any forward-looking statement, whether as a result of new information, future events or otherwise.